On long journeys (or short journeys), what better way to pass the time than getting lost in a story? You’re confined to your tiny airplane seat, so you pull out a novel. 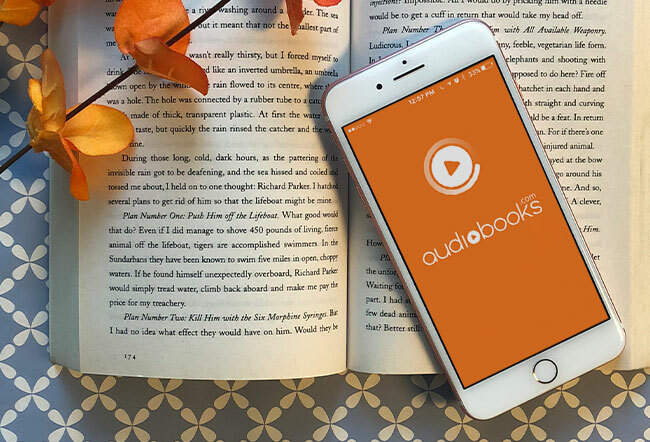 Here’s the question: Is your novel in print or audio? Audio lets you gaze out the window while listening. Your eyes aren’t locked onto a book or screen, so you can take in the passing landscapes. Depending on where the book is set, your view might even inspire better visuals in your imagination. But you don’t always have capacity to travel with loads of books. Even if you’re an eBook reader, phone screens are tiny for reading, phones are easier to transport than e-readers, and you’re guaranteed to have it on you in a pinch. You can load your phone with as many books as you want ahead of time so you’re prepared no matter how long you’re travelling for. No added weight, and no data required! We’ve long seen audiobooks as the superior form of travel, so I hope this post helps you see the light, along with the view. BONUS: Looking for the perfect travel companion? Here are some of our faves this spring! Goenawan’s dark, spellbinding literary debut opens with a murder and shines a spotlight onto life in fictional small-town Japan. Ren Ishida is nearly finished with graduate school when he receives news of his sister, Keiko’s, sudden death. Haunted in his dreams by a young girl, Ren struggles to find solace in the void his sister has left behind. International bestselling author Kristin Harmel tells the tale of an American woman, a British RAF pilot, and a young Jewish teenager whose lives intersect in occupied Paris during the tumultuous days of World War II. Rich with historical drama and emotional depth, this is an unforgettable story that will stay with you long after the final word. From award-winning writer Aminatta Forna, a stunning novel bringing an American scientist and a Ghanaian psychologist together in London in a hunt for a missing boy. A tale of loss, hope, love, compassion, culture, and the true meaning of happiness. Laura hails from the Upper East Side of Manhattan. One weekend in 1981 she meets Jefferson. The two sleep together. He vanishes. And Laura realizes she’s pregnant. Enter: Emma. An insightful exploration of class and family warfare from a new author whose sensibility, wit, and prose celebrate what makes us human. This entry was posted in Tips & Tech and tagged multitasking, travel by Emma. Bookmark the permalink.